Be careful what you wish for! I needed and idea for a blog post and my kitchen faucet obliged by breaking. Thank you very much household fixtures! This did bring about ideas for two posts which is why you get a two fer. The first part of the two fer is a little life lesson in buying kitchen faucets. Have you ever heard the saying, “A fool learns from his mistakes, but a truly wise man learns from the mistakes of others”? Cheaper too. Here is your “learn from the mistakes of others” moment. When you are buying a new faucet and you pick out the coolest one you see, it fits in your price range but it’s plastic, pass it up or buy a cheaper and less fancy shmancy one that is metal. 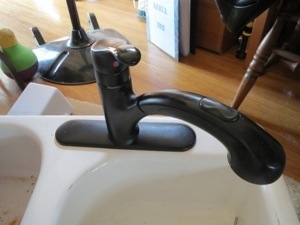 If not you will most likely be replacing that faucet AGAIN in a couple years when the plastic parts start to wear out and it becomes all wobbly and hard to turn off and on. And believe me when I say that replacing a faucet is not something you want to get good at. As a matter of fact, if you do have to replace the faucet just block out the day and have beer (notice im using plural) on hand for the end because you will deserve it! My very handy friend Evan warned me that my plastic faucet would wear out but he was a day later (and I was a dollar short). Here is the offending faucet. It looked cool in the store and I was in a pinch because my then current faucet had developed a leak. It fit in my then much more meager budget most importantly. I COULD get a simple metal one but look, this one had a pull out faucet sprayer and it’s black! Let me tell you that cheap stuff ain’t good and good stuff ain’t cheap I guess. This brings me to my second post idea. I’m pairing this up with a tool tip. The tool? 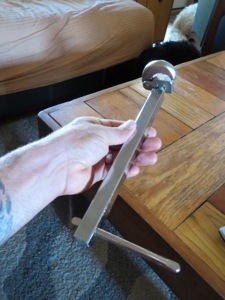 Wait for it………the basin wrench! You will honestly only need this darned thing two or three times per house you own, if that. That being said you will kiss the underside of a toilet lid in thankfulness for having one when it is needed. You may ask, what in the world could make this tool to cool for school?! Well, it is a very specialized tool. You use it to loosen the bolts that secure the faucet to the counter on the bottom (underside) of the faucet. It works for kitchen faucets, bathroom faucets, wet bar faucets, you get the picture. 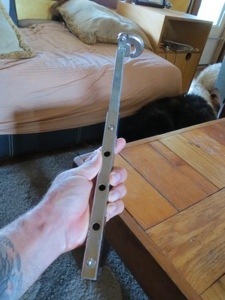 The next two pics are of my basin wrench, one shortened and one extended. It has jaws on the end that flip from one side to the other depending on whether you are loosening or tightening and it extends so you can lay on your back and still reach the bolts if they are higher up. Patience is a prerequisite with this tool. You really have to get the hang of it but once you do it is ingenious. Now I will say that not every faucet needs this tool these days. If it takes another tool to tighten the bolts it will usually be included in the faucet set. Keep this included tool when you are done in case you need to retighten or remove the faucet at some point. The last helpful hint is to get yourself a bucket to keep on hand, lots towels (paper or otherwise), familiarize yourself with the main water shut off to the whole house (just in case and yes there is a story behind that for another post), various other assorted adjustable wrenches, many other little annoying things which I am forgetting and only get used enough for me to know I have them but not where they are and finally, your beverage of choice for the finish line!! I went Sierra Pale Ale and I deserved every drop. I decided to replace the sink while I was at it and our old sink was enameled cast iron. You have not felt heavy till you have lifted out a cast iron double bowl sink on your own!! Good golly Miss Molly!! That’s it for now. Buy the best metal fixture you can afford and get a basin wrench if needed before you start. If you never use it it’s always cool to casually say to a friend, “Oh yeah, of course I have one of those” and loan it out for a six pack of good beer. Two times and you have paid for your basin wrench AND you look like a cool handy person who has any tool you need. Already bought faucet and new sink which I installed on Tuesday. Unfortunately for me I have the tools and experience to do this myself!! Doesn’t mean I like to but that’s another story (although it is a nice feeling of gratification when you finish and it gives my wife a reason to keep me around for another month or two). Glad to help. I knew you could do it, but thought I’d save you the trouble of trying to open your beer while your arm is stuck behind the disposer and dirty p-trap water is dripping on your head! See you soon.